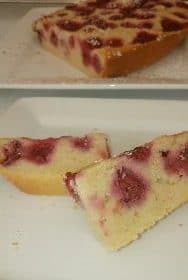 Try this low fat, low sugar Semolina Raspberry Cake for a handy lunchbox filler. It is easy to make and really delicious. Semolina is easy to buy at any supermarket, it is a great to use grain. 1 cup Greek yoghurt Icing sugar to serve. Preheat oven to 175 degrees Celsius. Grease a 23x4cm Pyrex pie dish. Beat the egg whites and vanilla extract until stiff peaks form. Set aside. Beat together the egg yolks, butter and maple syrup for a couple of minutes. Mix through the lemon zest, then stir through the yoghurt. Mix together the semolina and baking powder in a large bowl and make a well in the centre, add the yoghurt mix and stir until just combined. Gently fold the egg whites into the cake mix using a large metal spoon. 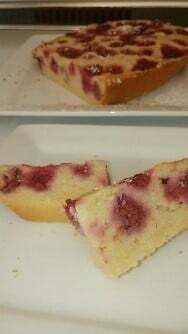 Pour half the cake mix into the dish, then dot with half the frozen raspberries. Pour the rest of the batter over the top. Push the remaining frozen raspberries into the top of the cake. Bake for 1 hour 10 minutes, or until golden and a skewer inserted into the middle comes out clean. Let cake sit for 15 minutes before turning out onto a wire rack to cool. Dust the top with icing sugar and cut into serving size pieces. This is great for lunch boxes and your kids dental health as well as yours.